Oct. 16 – SAINT MARGARET MARY ALACOQUE, Virgin. Born in France, St. Margaret (1647-1690) became a religious of the Visitation Order and had many mystical experiences and revelations concerning the devotion to the Sacred Heart of Jesus. She endeavored to propagate this devotion to the whole Church. During the reign of King Louis XIV, in a convent in France, the reaction against the devastating influence of Bishop Cornelius Jansen’s book “Augustinus” was initiated by a St. Margaret Mary. Jansen’s book led a revolution against Christian piety and obedience to the pope. Jansen thought that God had not loved men so much so as to die for all of them, presenting God as a cold, distant, indifferent Being before the good or bad behavior of men, who act good or badly in an irresistible manner; God for Jansen is a judge rather than a father. The consequences for Christian piety were disastrous, from the despise for prayer to the practical neglect of the sacraments. Bishop Cornelius Jansen was called; he died in 1638. He died regretting his mistakes and united with the Church, but his death prevented his public retraction. Margarita was born in Lauthecourt on July 22, 1647. She studied at the Poor Clares at Charolle. She got ill and paralyzed but miraculously got cured of it, attributing her cure to the Virgin Mary. She spent her youth full of vitality, with plenty of social life and desirous for affection. At 22 years of age, and after receiving communion, she took the firm decision to enter into religious life. She told her family with the added request that they dissuade and deal with her suitors. The Bishop approved her decision and allowed to add the name of Mary to her name. In May 25, 1671, she entered the monastery of the Salesians in Paray-le-Monial. She professed her vows in the Order of the Visitation of Our Lady on November 6, 1672. Margaret Mary was soon to be recognized by her love for Jesus Christ in the Eucharist. In the years 1673-1674, she had visions of Christ who showed to her his compassionate and bleeding heart, bottomless abyss of love for men: this will be the foundation of the Catholic devotion to the Sacred Heart of Jesus. Margarita understood that private revelation she received is a Divine will which she couldn’t just keep it for herself. She told her Superior about it and to the competent Church authorities, who thought it so strange that sent it to be examined by some experts. The result: she was treated as a “visionary. From this moment onwards, part of her daily cross was to obey and remain at their disposal. Nevertheless, Father Claude de la Colombiere, superior of the Jesuits believed and encouraged her when she opened her soul to him in a retreat he preached to the Visitation nuns. Margarita is a nun in whom one can trust: a nun who was always sick, very shy, timid but dependable for any work entrusted to her. She was a nurse, a teacher of the students of distinguished families living at the school, head of the novices, and among those considered to be the superior. “BEHOLD THE HEART WHICH HAS SO LOVED MEN THAT IT HAS SPARED NOTHING, EVEN TO EXHAUSTING AND CONSUMING ITSELF, IN ORDER TO TESTIFY ITS LOVE; AND IN RETURN, I RECEIVE FROM THE GREATER PART ONLY INGRATITUDE, BY THEIR IRREVERENCE AND SACRILEGE, AND BY THE COLDNESS AND CONTEMPT THEY HAVE FOR ME IN THIS SACRAMENT OF LOVE. BUT WHAT I FEEL MOST KEENLY IS THAT IT IS HEARTS WHICH ARE CONSECRATED TO ME, THAT TREAT ME THUS. THEREFORE, I ASK OF YOU THAT THE FRIDAY AFTER THE OCTAVE OF CORPUS CHRISTI BE SET APART FOR A SPECIAL FEAST TO HONOR MY HEART, BY COMMUNICATING ON THAT DAY, AND MAKING REPARATION TO IT BY A SOLEMN ACT, IN ORDER TO MAKE AMENDS FOR THE INDIGNITIES WHICH IT HAS RECEIVED DURING THE TIME IT HAS BEEN EXPOSED ON THE ALTARS. After experience, Margaret Mary did all she could in promoting the devotion to the Sacred Heart of Jesus with all the means at her disposal: by letter, person conversations, communicating favors, distributing small prayer cards, writing to the chaplain of King Louis XIV to ask him to consecrate himself, his family and the palace to the Sacred Heart. She tried to get the approval to celebrate the Mass of the Sacred Heart. She spread God’s Will in a special way to the nuns and priests. The devotion began in of Paray-le-Monial and from there to the Salesian communities in Dijon, Moulins, Saumur; then, Lyon and Marseille; then to Europe and America. The result of this activity is an explosion of fervor and a desire to seek holiness. She did not succeed, nevertheless, without bitter difficulties and obstacles from those who were influenced by Jansenism and by those who considered unnecessary a new practice of piety. The devotion to the Heart of Jesus propagated by Margaret is not a surge of sentiments nor is founded on feelings which are at the same time sugary and fleeting. She understood that the love for Jesus Christ suffering in the Garden has to be expressed by atonement and reparation for the offenses committed all the time. It is to participate in the pain, anguish, loneliness and abandonment that Jesus suffered for the sins of mankind. This is carried out with desires of fidelity and of personal purification, in continuous search of the Eucharist to accompany Our Lord, in a living desire of communion, and in the need to live dying unto oneself for God’s glory and for the salvation of mankind, thus, counteracting the destructive work of sin. For this reason, the devotion’s message to the Christian world consists in simple and strong practices impregnated with firm faith, and at the reach of anyone: Mass, frequent Communions, visits, prayer and holy hours. Margaret Mary died on October 17, 1690. Pope Benedict XV canonized her on 13 May 1920. In the Bull of canonization an explicit mention of the promise of final perseverance to those who communicate on the First Friday of nine consecutive months was made. 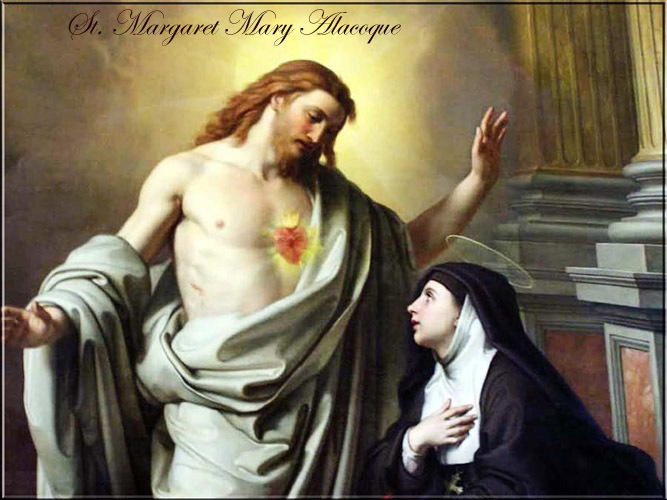 Dear friends, let us thank St. Margaret Mary of Alacoque for her generous correspondence to God’s Will in spreading the devotion to the Sacred Heart of Jesus. May her feast today lead us to atone and repair for all the sins of mankind by loving Our Lord in the Holy Eucharist, through the frequent attendance of the Holy Mass (if possible, daily), reception of the Holy Communion and daily visits to the Blessed Sacrament. HOLINESS IN DAILY TASKS DONE OUT OF LOVE. Seek, find and love God in the little things of each day!